The Wollongong Council Administration Building Car Park comprises 9 levels and services approximately 320 vehicles. Constructed prior to 1989, the car park was found to have a balustrade system that did not satisfy the BCA or the loading requirements of AS/NZS 1170.1. 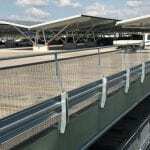 The existing balustrade was removed and replaced with 1,000m of RHINO-STOP® Type 4 car park barrier to the perimeter, split level and ramp locations.